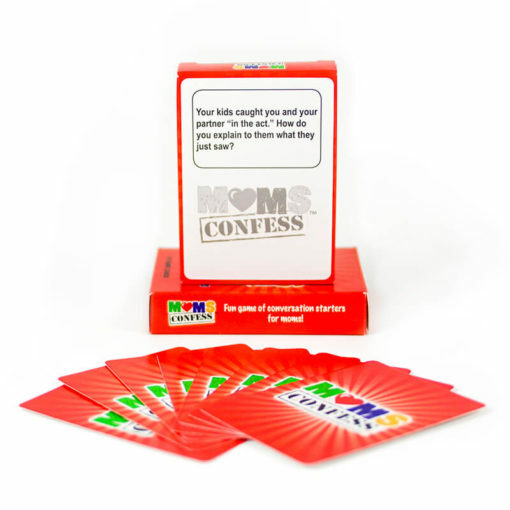 Moms Confess is a fun game of conversation starters created by a mom for moms. It’ll help you feel less crazy and more normal…and more connected to other moms just like you. 55 hilarious questions to spark fun conversation between moms. If you want to laugh, vent and connect with other moms, this game is for you. Are you ready to confess? What a Hidden Gem! Was looking for something to keep us occupied on a play date, and this was a hit! It’s like the creator new exactly what we were thinking. We laughed hysterically when we all had the same answer to one of the questions. Can’t wait for our next get together! Definitely worth the money! OMG! Finally a fun relatable game for moms!! Me and my mom friends like to get together once a month for game night and it was my turn to introduce a new game. I brought this card game and we had a blast! I highly recommend to other mom’s out there! 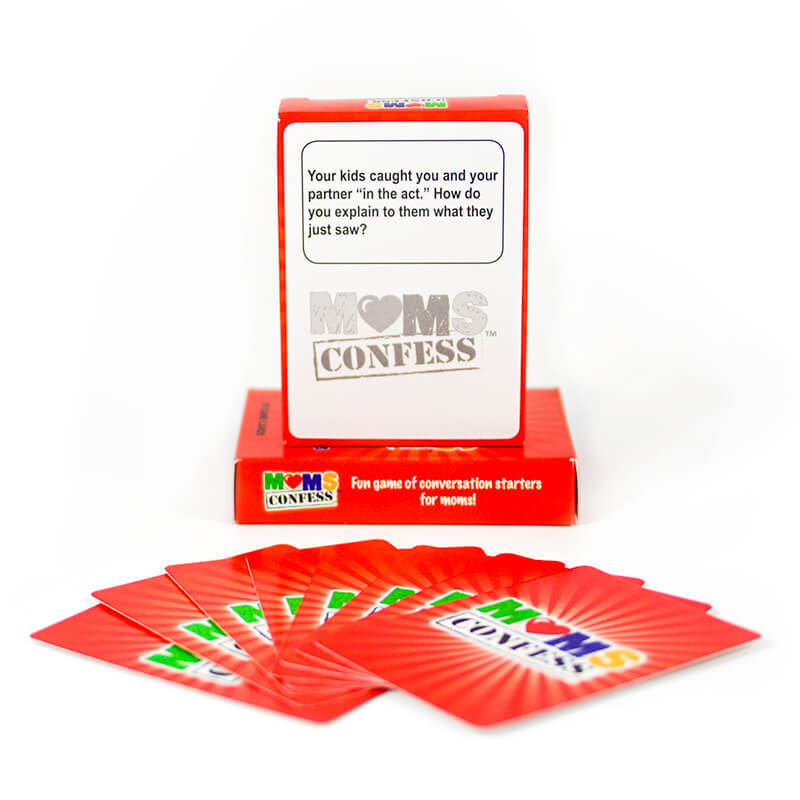 “Moms confess is the first game that I’ve come across that’s strictly just for moms and I love that! Personally, I am not a mother (yet) but I think it’s great that Moms now have a game that’s just for them. I also think that the Moms Confess card game definitely makes a great, affordable and unique gift for any mom that you know! Perfect for an icebreaker or a gathering amongst friends.” Let me know how to post it on this page. Hope all is well! What an awesome way for mamas to chat and get to know one another! 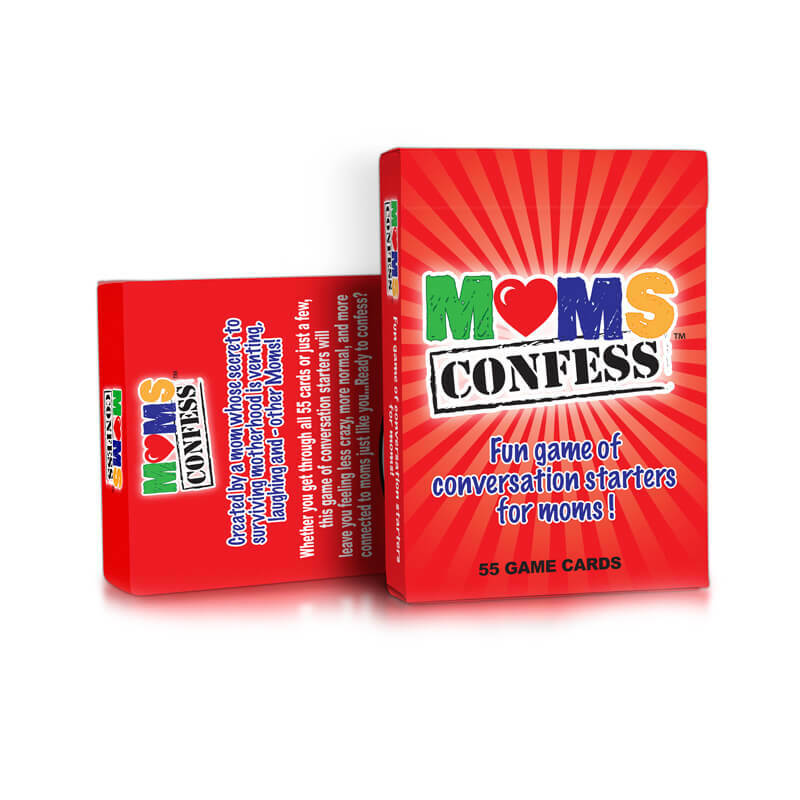 Even in moms groups where everyone may not know each other, Moms Confess gives them a way to break the ice. It’s hilarious and so real. Love it. Great icebreaker to open up conversation with other moms. Soccer practice, BBQs, birthday parties, I’ve done them all. Interesting and funny stories all around! I had so much fun playing this game with a dear friend. We laughed a lot, got to know each other even more and it opened up some interesting lines of discussion. I recommend popping open a bottle of wine, putting out some chocolate and gathering your girlfriends to play this game. Such an interesting way to talk about your kids and feel normal. I love this game.